There are many types of resorts on the island and if you are looking specifically for a Phi Phi beachfront pool villa resort you have come to the right article. Many resorts are beachfront and have a pool with villa accommodation but none have private pool facilities. The Phi Phi beachfront pool villa resort vary between the pool 3 and 4 star resorts with excellent cabins, cottages and villas on the beachfront to the private pool villas on beachfront hotels but are set back on the mountain side overlooking the beach. 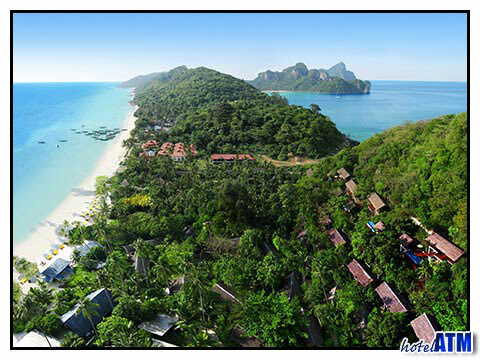 The 3 and 4 star resorts with excellent accommodation are mainly centered on Phi Phi Don Village and Long Beach. The Phi Phi Villa Resort has a cute pool and a couple of fine Luxury Deluxe Beach Front villas though the reviews are mixed. The popular Andaman Beach Resort has budget beachfront accommodation in simple cottages. The Phi Phi The Beach Resort on Long Beach is right on the beach with stunning views over towards Phi Phi Ley. The main luxury 4 and 5 star Phi Phi beachfront pool villa resort are the Zeavola Phi Phi Resort, Holiday Inn Phi Phi Island and Outrigger Phi Phi Island Resort and Spa (previously Phi Phi Island Village Resort And Spa). These are the island's best reviewed resorts and highly sort after. They are all on the east coast of Phi Phi, away from the more touristic area of Phi Phi Don Village and offer a real get-away experience. The cool north easterly wind picks up during the hot months making them ideal resorts November till the end of April. In low season these top resorts often vie with each other and promote free night specials and early booking discounts to endeavour to keep the properties busy. See the deals below. As of the time of writing this article (2012 Oct)there are only 2 Private Phi Phi pool villa resorts. The 5 star Zeavola Phi Phi Resort, has 4 wonderfully attired Pool Villas that overlook the resort and Mosquito and Bamboo Islands. The feeling of space, privacy and seclusion marks this accommodation type out as extraordinary for comfort and luxury. The highest ratings and reviews for the Zeavola Phi Phi Resort on the island are no mistake. The 4 star Phi Phi Island Village Villa is, like the Zeavola, set back from the beach front but overlooking the rest of the resort. This larger resort has a greater variety of facilities than the Zeavola, a longer beach front, more restaurants and pools and Loh Bagao has a more private setting. The 2 story villa is the largest accommodation on Phi Phi Island and is more secluded due to a greater use of tropical landscaping between the 6 villas. The Phi Phi beachfront pool villa resort deals offer all the latest Free Night Specials, Fixed Night Promotions, Special Discounts, Early Bird and Honeymoon offers. HotelATM and phi-phi.com also do their “long stay free night special for all accommodation on their website. You can also find all the deals” for each resort on each resort fact sheet page by looking for the Free Night Specials link (in red) on the top right hand navigation. By going to the Phi Phi Accommodation resource you can find further articles on "Best Luxury Bungalows on Phi Phi", "Koh Phi Phi Outrigger", "Phi Phi beachfront resorts", "Luxury Phi Phi villas", "High End Hotels on Phi Phi", "Phi Phi Diving Resorts".